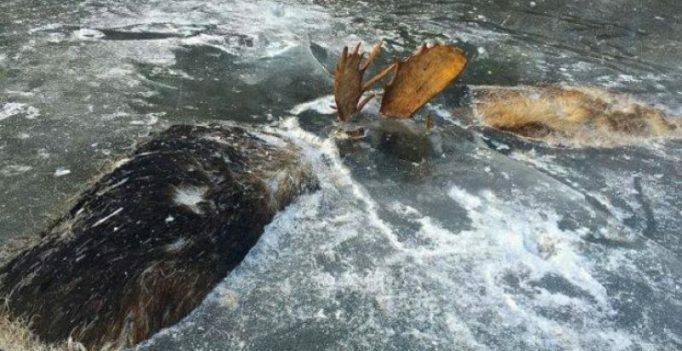 Anchorage, Alaska: Two moose were recently discovered frozen in battle and encased in ice near a remote village on Alaska’s unforgiving western coast. Brad Webster, a middle school social studies and science teacher in Unalakleet, captured images of the massive animals poking through the ice as they lay on their sides with antlers apparently locked together. He had taken a friend who recently moved to the village for a walk on Nov. 2 near a frozen slough at Covenant Bible Camp, where Webster volunteers as a camp steward. “That’s when we saw it,” he said in a phone interview Friday. He initially thought it was just one moose that had been shot but when he got a closer look, he saw the second moose. It took him a moment to realize what he was seeing, he said. It was the end of moose rutting season, and the animals likely were fighting over a female moose. Webster speculates that one of the animals was wounded by the other animal’s antlers, and perhaps died as their antlers were caught together, dragging the rival down with it. 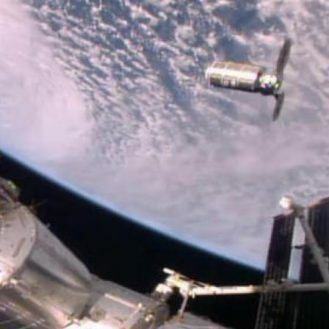 “It was a very interesting experience,” Webster said of the discovery. On the way back to Unalakleet, he and his friend kept thinking about it and saying, “We really saw that,” in amazement, Webster recalled. Jeff Erickson, student activities director of Bering Strait School District in Unalakleet, also captured the images when he went to check out the scene a couple days later with Webster. Erickson grew up in the area and has hunted for 50 years but has never seen anything like this, “frozen in time,” he said in an email to The Associated Press. “It was such a surreal sight – so serene and quiet, but a stark vision of how brutally harsh life can be,” he wrote. Webster, Erickson and a few others went back later and removed the animals from about 8 inches of ice covering open water, recovering some of the spoiled meat for dog food and trapping bait. Webster said the meat was left at the site for anyone wanting it. They took the heads, which are still frozen and being kept for now in Webster’s yard. The plan is to clean them out for mounting as bleached skulls at the Bible camp.